Abstract – Although ‘Brexit’ and the refugee crisis have grabbed today’s headlines, the European Union’s sovereign debt crisis continues to be of major concern. The Eurozone’s comparatively poor economic performance and continued political divisiveness have combined with processes focused on ‘governing by rules and ruling by numbers’ to generate a crisis not just of economics and politics but also of democratic legitimacy. Professor Schmidt argues that the EU’s (euro) crisis of legitimacy centers on problems related to (a lack of) policy effectiveness, political responsiveness, and procedural quality. But she also contends that in pursuit of legitimacy as much as in response to deteriorating economics and increasing political volatility, EU institutional actors – ECB, Council, Commission, and EP – incrementally reinterpreted the rules and recalibrated the numbers ‘by stealth,’ that is, without admitting it in their public discourse. To theorize about such processes of ideation innovation and discursive legitimation during the Eurozone crisis, Prof. Schmidt uses the neo-institutionalist framework of discursive institutionalism. 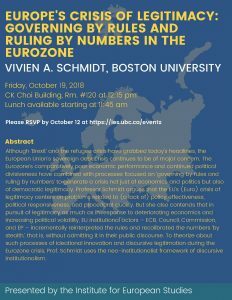 Bio – Vivien A. Schmidt is Jean Monnet Professor of European Integration, Professor of International Relations in the Frederick S. Pardee School of Global Studies and Professor of Political Science at Boston University, as well as Founding Director of BU’s Center for the Study of Europe. She received her B.A. from Bryn Mawr College and her Masters and PhD from the University of Chicago. Schmidt’s research focuses on European political economy, institutions, democracy, and political theory – in particular on the importance of ideas and discourse in political analysis. Her honors, awards and fellowships include a Guggenheim Fellowship, an honorary doctorate from the Free University of Brussels (ULB), the Belgian Franqui Interuniversity Chair for foreign scholars, a Rockefeller Bellagio Center Residency, and Fulbright Fellowships to France and the UK.